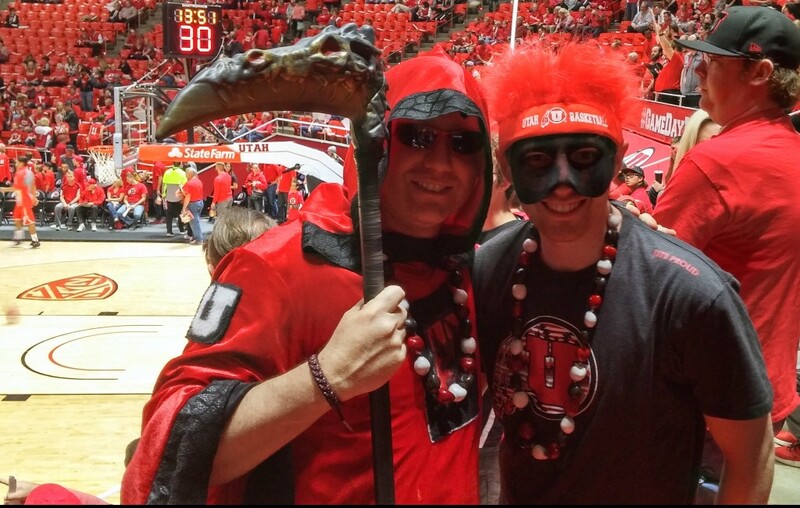 COMMENTARY — The Runnin’ Utes are red hot and peaking at the perfect time of the season. A much improved offense was on display as Utah swept a home stand against the Arizona schools. The Runnin’ Ute shooters thrashed Arizona State 81-46. The game was over within the first few minutes as Utah, led by Jordan Loveridge and Brandon Taylor, made five 3-pointers in as many attempts to go up 15-0. It didn’t get any better from there for the Sun Devils as the Runnin’ Utes pushed the score to an incredible 30-2. Give the MUSS sportsmanship points for loudly cheering Arizona State’s second field goal of the game late in the first half. By halftime, the Sun Devils had barely managed 10 points. In the second half, Arizona State managed to substantially improve upon its number of points scored. However, that was mainly due to Utah playing its bench for the bulk of the second half while the Sun Devils still had their starters in the game. The game was so out of hand that Utah walk-on senior Austin Eastman got to play for the final six minutes, whereas he typically only plays the last few minutes of blowout games. The MUSS even chanted MVP when Eastman dove and deflected an Arizona State pass out of bounds. In stark contrast to the cakewalk of a game against the Sun Devils, the Runnin’ Utes had a real challenge Saturday afternoon as the Arizona Wildcats came to Salt Lake City. The last couple of seasons it seems that Arizona is becoming Utah’s arch nemesis in the Pac-12 — Or at least to me they are. Going into Saturday, the Runnin’ Utes had yet to beat the Wildcats since joining the Pac-12. The last couple of seasons, the games had been close and arguably Utah should have won multiple games if they could only have made a couple of late free throws and made a defensive stop or two. The losses both in Salt Lake and in Tucson have made it so that a fabulous Runnin’ Utes team has often been overshadowed by the Wildcats. That’s the primary reason I think a rivalry might be soon forming between these teams. You could tell how big the game was to Utah fans. Rather than the typical 90 minutes before tipoff, the doors opened a full two hours before the game and the line for the student section encircled the Huntsman Center. The line was so long, I almost wondered if it was a Red Rocks gymnastics meet instead of a basketball game. The star of the game was senior point guard Brandon Taylor. The whole contest was competitive as the Wildcats would not go away and kept making runs in the second half to keep it close and even take the lead. When the going got tough, Taylor got going. He made some clutch shots and some fantastic defensive plays in the second half to keep the Runnin’ Utes in the game and stop the Arizona runs. With a minute left in the game and with Utah up by only two points, Taylor broke the ankles of a Wildcat defender and knocked down a 3-point shot to put the Utes up by 5 as the crowd roared with appreciation. Taylor would go on to make another free throw to give Utah its first conference victory over Arizona with a score of 70-64. 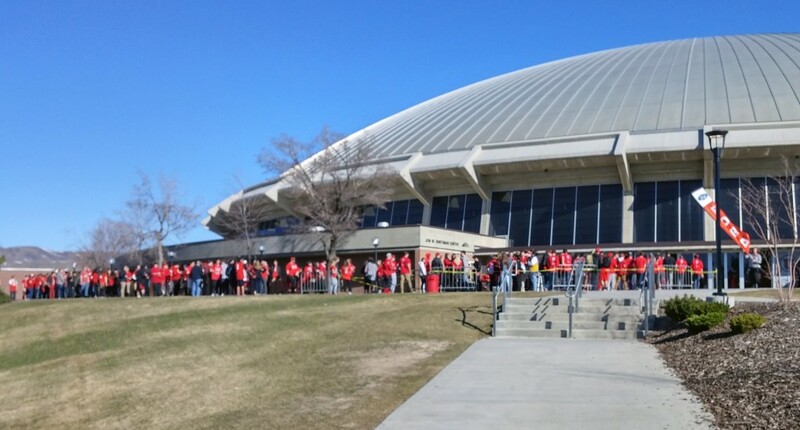 While the crowd, myself included, cheered ourselves hoarse, I couldn’t help but think about how a couple of seasons ago Taylor was given most, if not all, of the blame by a lot of Utah fans when the Runnin’ Utes lost a heartbreaker to the Wildcats in the Huntsman Center. He wasn’t able to make free throws and other shots late in the game and many pointed at the guard as the main reason for the loss. Two seasons later, in his second to last home game as a Runnin’ Ute, Taylor played arguably his best game of the season and it seemed completely fitting that, after so much criticism a couple of years ago, he was the one who made clutch shots and free throws at the end of the game to propel Utah to victory. Some may remember that back in late November the Runnin’ Utes were playing well, but were not as good as some, including me, expected them to be at the start of the season. However, if you recall I said not to worry and predicted that come March, Utah would be the best team in the Pac-12. Well, it’s now March and in conference play, the Runnin’ Utes are neck and neck with Oregon in leading the conference and have clinched a first round bye in the upcoming conference tournament. Utah is going to be a tough team to beat in the Pac-12 Tournament and in the NCAA Tournament. Watch out, because here come the Runnin Utes! Utah plays its last home game of the season this Saturday, March 5, against the Colorado Buffaloes, with a 7 p.m. tipoff on ESPNU. How about those Red Rocks! The Red Rocks continue to dominate as the No. 6-ranked team in the country. 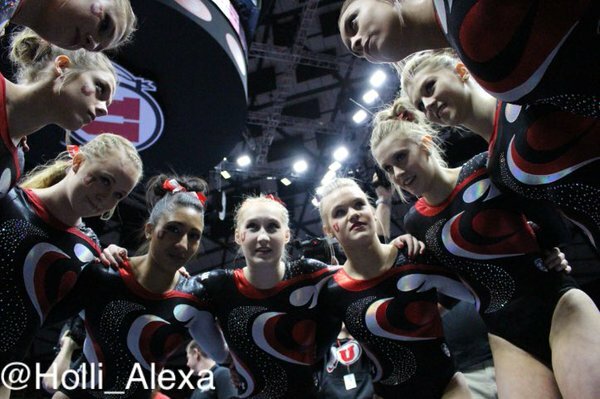 This past Saturday they competed in California as they faced off against No, 14 Cal. This was the second of four consecutive senior nights in which Utah will participate to end the regular season. The Red Rocks scored 197.025 to beat the Golden Bears’ score of 196.750, making it Utah’s fifth straight 197-plus point performance and second straight win over a Top 15 opponent on the road (Utah also beat No. 12 Stanford last week in Palo Alto). I, for one, personally forgive her as well for falling because I would probably fall off that beam every single time if I tried to do any of the things that she does while she is on that thing. There were also fantastic performances from the rest of the team that propelled the Red Rocks to victory in the final set after it being close the entire meet. Utah has another road trip this week to face off against No. 5 Michigan on Friday (for Michigan’s senior night) and then will finish off the regular season back in Salt Lake City against No. 10 Georgia (for the Red Rocks’ senior night). Here’s hoping the Runnin’ Utes and Red Rocks can keep the good times rolling! Today’s Bleeding Red column was written by Josh Vance. The opinions expressed are not necessarily those of St. George News.